You'll be £14.99 closer to your next £10.00 credit when you purchase Flames of Calais. What's this? The defense of Calais in May/June 1940 was a superb example of selfless courage and sacrifice. Sent by Churchill to divert the Germans from Dunkirk and so save the British Army from wholesale annihilation and capture, 29 Brigade had orders not to evacuate or surrender. Airey Neave, later to be Margaret Thatcher's right hand man until his assassination in 1979, was one of those who fought, was wounded and captured there. He tells the story with panache. Winston Churchill's desperate attempt to evacuate more than 3000 men of the British Expeditionary Force encircled at Dunkirk, France in May 1940, overshadowed the fate of 29 Brigade, sacrificed at Calais. In a last minute attempt to stop a German armoured division reaching Dunkirk, the under- equipped 29 Brigade, lacking tanks, artillery and sufficient anti-aircraft guns, fought-off tank supported German attacks. Through-out daylight hours the city was ablaze from successive blitz by squadrons of Stuka dive-bombers. The glow from the burning city, could be seen against the night sky from Dunkirk's beaches. Lacking current intelligence, orders from GHQ Dover was often out-of-date and misleading while in Calais central control of the resistance was almost non-existent. There were no evacuation plans, they were to fight until they died. To the last bullet. The aim was to draw off German tanks, gaining time to evacuate the BEF trapped at Dunkirk.This is a soldier's story told by Airey Neave who was a young Royal Artillery subaltern trapped, wounded and captured in Calais. Imprisoned in the infamous Colditz Castle, he escaped and became the first British escapee to make a 'home run' and reach Britain. Recruited by MI9 and he took part in the rescue of British airborne soldiers after Arnhem. 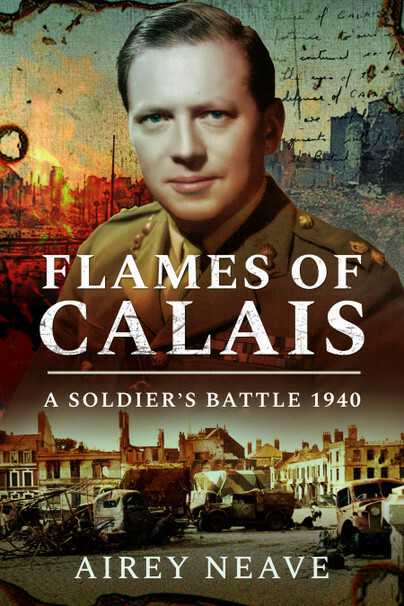 Post war he researched German and British military records concerning the battle for Calais and 'Flames of Calais' was originally published in 1972. Post-war he became MP for Abingdon and Shadow Secretary of State in Margaret Thatcher's Cabinet. He was murdered by the Irish Liberation Army as he drove his car from the Houses of Parliament car park on 30 March 1979.